Johnny Cash is one of the world’s best-known Arkansawyers — and the festival exploring his roots in the state is establishing its own roots in his boyhood home of Dyess. 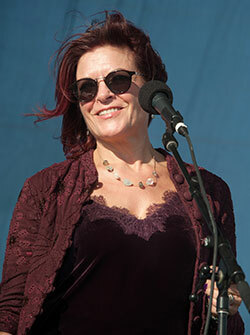 John Carter Cash will also perform, as will Ana Cristina Cash. The latter is new to the Cash family lineup — the 33-year-old Miami-born singer married John Carter in October 2016. Shawn Camp, a Grammy-winning singer-songwriter born in Perryville (Perry County), will also perform at Saturday’s ticketed concert, which will take place in the cotton fields adjacent to the restored Cash home. Johnny was born J.R. Cash in Kingsland (Cleveland County) in south Arkansas, and raised in Dyess (Mississippi County) in northeast Arkansas. The festival is coordinated through Arkansas State University’s (ASU) Heritage Sites and its Heritage Studies doctoral program, and is licensed through the John R. Cash Revocable Trust. Presenting sponsors include the Electric Cooperatives of Arkansas and the Judd Hill Foundation. And while the Johnny Cash Heritage Festival is new, the idea of a Cash festival in northeast Arkansas isn’t. The Dyess festival evolved from the Johnny Cash Music Festival in Jonesboro, first held in 2011 on the ASU campus. Avid Cash fans know Dyess (pronounced “Dice” by locals) was Cash’s boyhood hometown — and is also home of the emerging renovation of the historic Dyess Colony, created under the New Deal. Dyess was established in 1934 as an agrarian community set up by the U.S. government during the Great Depression. The Cash family applied after hearing about the project on the radio, and moved there in 1935 to start a new life in Mississippi County. “I grew up under socialism,” Cash later said of the time. 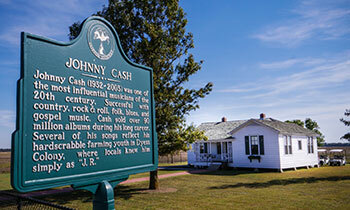 The buildings in Dyess — and, as of May, Cash’s home — are on the National Register of Historic Places. Former Dyess residents and others with memories of the Great Depression are encouraged to contact festival organizers in advance to share their stories. “The JCHF is like attending a homecoming event in your own community; you don’t have to be from Dyess to feel it,” said Mike Doyle. “Johnny Cash mirrors so much of the humanity of us all.” Doyle was station manager of KASU, the NPR station at ASU, until his retirement in June. He’s still part of KASU Music Nights, held at Dyess Colony Circle, the hub of the community since it was created. The first day of the festival features music at Dyess Colony Circle with TRIPPP, real-life triplets who are juniors at Jonesboro High School; Little Rock singer-songwriter Mark Currey; Paragould’s Drive South band; and, blues from Billy Jones Bluez. Friday’s music at the Colony Circle is Stephen Hardy of South Carolina, who portrayed Johnny Cash in productions of Million Dollar Quartet; blues from Marcus “Mookie” Cartwright of Helena; folk music from Mountain View trio, Harmony; the Zyndall Wayne Raney Band; and singer-songwiter Corey Jackson. All music and symposium events are free, except for the ticketed Saturday concert with the headliners. Arkansas is embracing its Cash roots — and Cash never forgot his Arkansas roots. But, then, how could he? It’s where the music that made him famous began. Stephen Koch is author of Louis Jordan: Son of Arkansas, Father of R&B, and hosts “Arkansongs,” a segment about Arkansas music syndicated on public radio stations across Arkansas.